A little girl w akes up her dog. They play together until the dog eventually puts the little girl to sleep. A beautiful simple bedtime story with gentle watercolours. 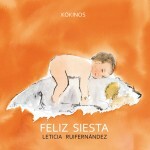 Leticia Ruifernández has won several awards and succeeds in HAPPY NAP to turn an everyday story into a tender poem. The text refers to a succession of actions – she approaches, walks away, looks for, finds, asks and gives – that describe basic steps in children’s discovery of the world around them. A perfect book to share during the day or at night. Even those reluctant to go to bed will not be able to resist. This entry was posted in Board Books and tagged Editorial Kókinos on June 15, 2014 by sbarrouillet.